When I begin a painting or a drawing, it is usually the subject matter that determines the medium. I enjoy working in so many mediums that it is hard to say I have a favorite. However, sometimes a client has a certain vision in mind or a particular feeling that they may want for their commissioned portrait. WATERCOLOR is a beautiful medium that offers spontaneity and the ability to blend transparent colors. It allows me to also create realistic opaque detail in my paintings. It can be used in traditional portraits and also works well when depicting a montage of images. I use Windsor & Newton transparent watercolors and gouache and work on an acid free watercolor board or paper. Watercolors should be matted and framed under glass. PASTEL AND PENCIL drawings have a certain softness and layering of colors that appeals to many people. 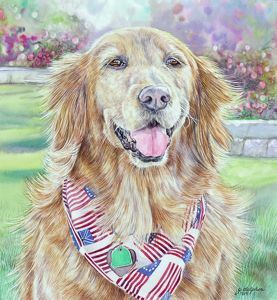 I use numerous brands of graphite pencils, colored pencils and various grades of pastel to create the realistic and fine detail of the animal. I use acid free bristol board and pastel paper, depending on the subject. Pastel and Pencil drawings should be matted, fixed and framed under glass. ACRYLIC is a versatile water based medium that can be used in a variety of techniques. I enjoy layering the colors, fine detail and often use painterly brush strokes. The end result is a painting with strong color and textural interest. It also does not require the extensive drying time that an oil painting does. I work on a sanded gesso panel or board that does not require glass when framed. OIL is a beautiful medium that is rich with color and texture, yet also depicts the softness and realistic quality of my work. There is nothing compared to the luminous tonal qualities of oil. My oils are painted on either professional canvas or on a finely sanded panel. Oil paintings do require a substantial drying time and should never be framed under glass.